No impact on electrical or material characteristics of components. The Enertia™ branded machine by Cool Clean Technologies, LLC successfully extracts volatiles from silicones and extractables from aerospace components at room temperature by exposing the component to liquid carbon dioxide under carefully controlled conditions. Liquid CO2, or LCO2 has several characteristics which make it an ideal extraction agent for removing volatiles from elastomer outgassing. Liquid CO2 has an affinity for silicones and other volatile monomers, can easily diffuse into porous elastomeric structures, and has very low surface tension. As a result, when the elastomer is exposed to liquid CO2, it first penetrates and solubilizes un-cured and non-crosslinked compounds, forming a solution which diffuses out of the elastomeric matrix and into the bulk of the chamber. Studies have shown that this process does not materially change most elastomers and has advantages over traditional bake-out and vacuum bake-out alternatives. The Enertia™ system for elastomer outgassing is a completely automated system. 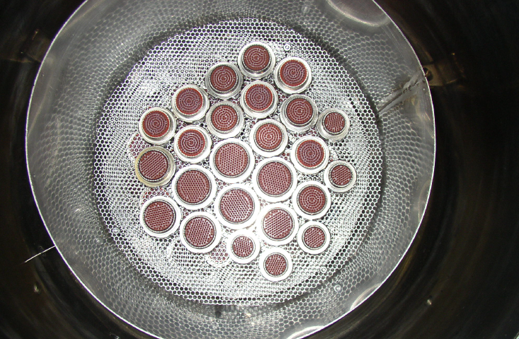 After the products to be extracted are inserted in the chamber and the start button is pressed, the system gently introduces liquid carbon dioxide into the chamber. The Enertia™ controls the process parameters and exposure time, and has a programmed pressure reduction scheme to safely reduce the pressure. Upon completion, the door is automatically opened and the parts are ready for use. The Enertia™ system is virtually a closed system, recovering 99% of the CO2 used in the process.